Special coins minted to commemorate a vow taken by an emperor on some special occasion, such as a wedding or the Kalends of January , or a vow taken by a ruler who was eager to make a propaganda statement. Augustus, in 27 B.C.E., promised to bring peace to the entire Roman world within 10 years. In 18 B.C.E., he accepted government over Rome for two five-year periods; in 8 B.C.E. for 10 years more; in 4 C.E. for yet another 10, and in 13 C.E. for one more decade. 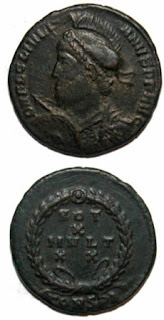 Other emperors issued votive coins, including Antoninus Pius, Marcus Aurelius, Commodus, and other emperors in the fourth century.